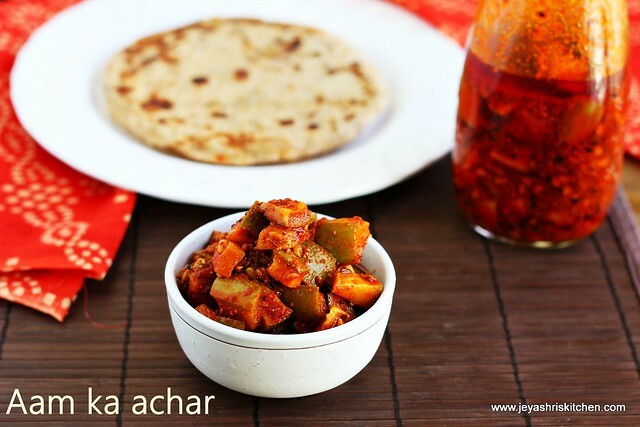 Punjabi mango pickle | aam ka achar is a popular pickle recipe of North India, usually made in summer season and stored for a year. 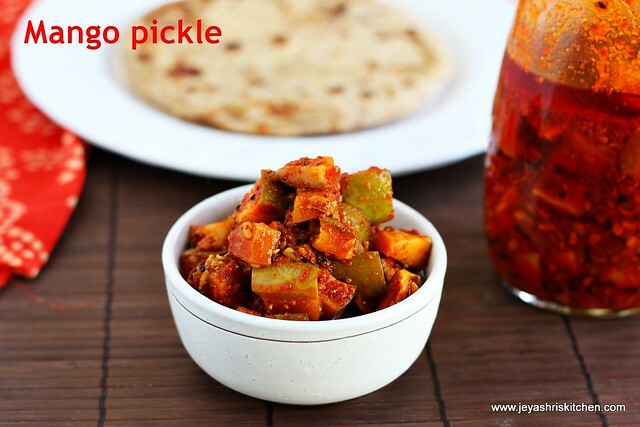 I have posted mango thokku, avakkai mango pickle recipe . This aam ka achaar is a north indian style of mango pickle, which i have tasted in many Indian restaurants here. Generally it is served with parathas. But it goes well with our south indian curd rice too. One my friend's mother in law passed on this recipe to me and it turned out so nice and tasted the same as we get in restaurants. Wash and cut the mango into cubes. Spread this in a clean white cloth. This step is to absorb the moisture. Let it dry in shade for a day or over night. The mangoes will shrink a bit after this. Transfer it in a glass bowl. Coarsely grind the fennel seeds, methi seeds and mustard seeds. Add the coarsely ground mixture to the mangoes. Add salt and kalonji seeds. Add red chili powder and 4 tblsp of mustard oil. Add the kalongi seeds. Mix well. Mix well and keep this covered with a muslin cloth. Keep it under the sun for 2 days . Keep it in a place at home where you get good sunlight. Now transfer it in a clean dry air tight porcelain or glass jar and add 1/2 cup of mustard oil to this. Mustard oil has a acquired taste but it only gives the authentic taste for the punjabi mango pickle . The measurement of salt depends on the sourness of the mango. So add accordingly. If you want the pickle more spicy add little more redchili powder. Ensure that there is no moisture in the mango before adding spices. Also ensure the jar which you are storing the mangoes is completely dry. The mustard oil has a acquired pungent smell, you can replace it with sesame oil of some people add cooking oil too. Even you can heat the mustard oil well and add to the pickle, it reduces the smell to some extent.